Starting your own business is challenging in so many ways. From the beginning, all of the choices you make can add up to success or failure. It starts with choosing the right team members to help you build your brand, which I feel very fortunate to have done. Next, you have to make business decisions regarding where to invest your energy and resources. When you are operating a startup, those choices are crucial. If you are paying close enough attention, sometimes the universe helps you by presenting the perfect opportunity at the perfect time. 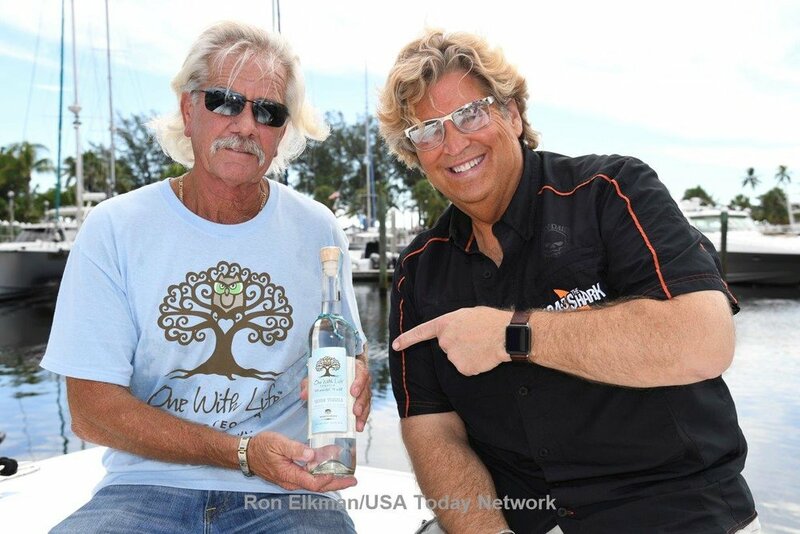 One With Life recently launched in South Florida and the reception there has been phenomenal. I am so grateful to have Nicole Avella and Randy Weber as part of the OWL team working hard to introduce our product in that market. 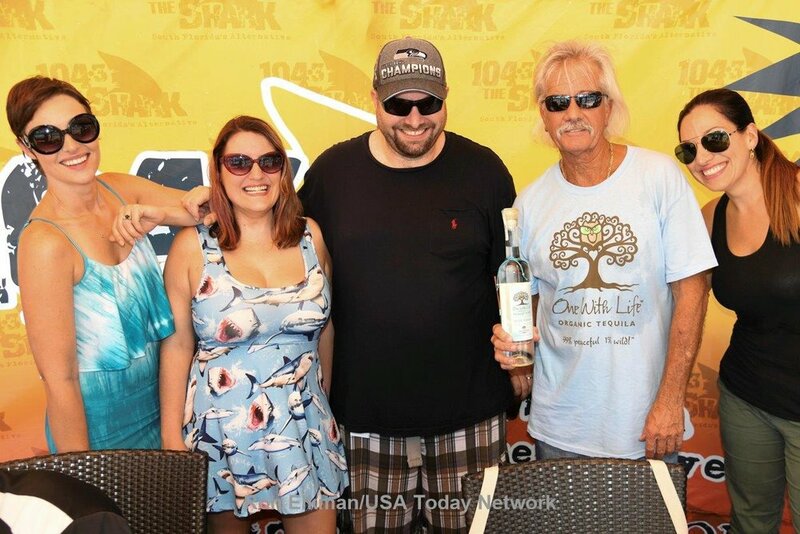 Through their network, OWL was presented with a tremendous opportunity to work with Entercom and Von Freeman to bring the inaugural Riptide Music Festival to Ft. Lauderdale Beach, December 3 & 4. I am thrilled that OWL is a sponsor of this exciting event. It is one of those opportunities that spoke directly to my heart. First, my son Nico, who is currently off at Berklee School of Music, is an aspiring musician. Listening to him play music day in and day out has reminded me of how important music is to soothe my soul. Because of Nico’s talent and passion, music has been a constant in my life. He reminded me of what I knew as a kid, which is that music is healing, inspiring and peaceful. Second, Ft Lauderdale, Florida was one of my father’s favorite destinations. From the time I was born, my dad took me to vacation in Ft Lauderdale every year. I can’t think about the lovely beach and sunshine there without thinking about my father, who I miss every day. Lastly, my mom, sisters, and best friends all live in South Florida. I feel like I am home every time I visit. So the combination of a music festival, desire to be near my family, and my love for south Florida was like, hey, I can’t think of a better way to spend a weekend. I decided to seize the opportunity the Universe has presented to me, which is the philosophy that I want to share through my brand. 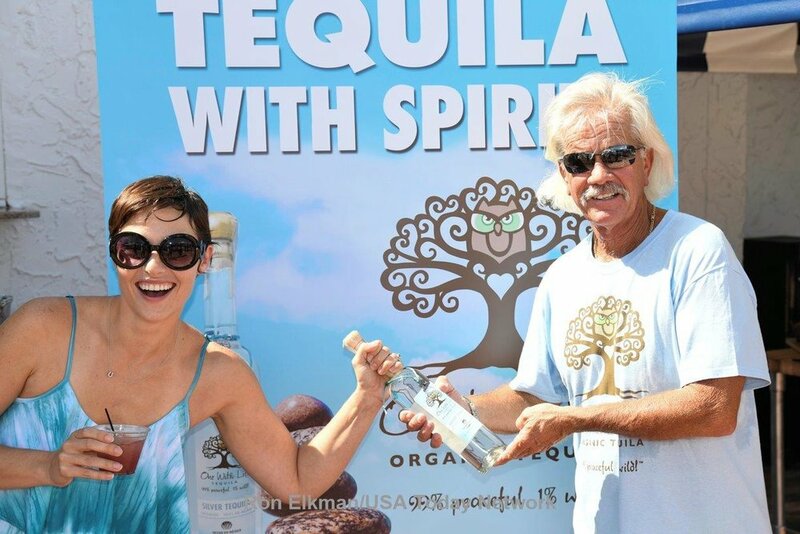 I have always maintained that One With Life Tequila was my vehicle for spreading the word of living a balanced life through staying in the present moment, being at peace, and having fun. This festival is going to be a lot of fun. The line-up includes some of my favorite bands growing up including the B-52’s and Earth, Wind and Fire. Some of you may also remember Expose and A Flock of Seagulls – a great blast from the past. I can’t wait to be hanging out with family and friends on Ft. Lauderdale Beach listening to awesome music, remembering my father, sipping my “Riptide” cocktail and being grateful for the opportunity to be a part of something special. Riptide Music Festival on Ft. Lauderdale Beach 12/3 & 12/4 Tickets on sale here! When I first started One With Life Tequila, I needed a graphic artist to help me create a label for my bottle. I immediately thought of Jeff Radden, who I met through a mutual friend, Jay Baron, in 2006 when I promoted pro-boxing shows at The Washington Ave Armory. I needed help designing my boxing posters and heard Jeff did amazing work. Though he mostly did much bigger jobs for major corporations, Jeff took mercy on me and did the work at the special ‘local boxing promoter rate’. His work was beyond creative. He ended up creating a poster for each of our 15 shows. The posters were so beautiful that I had them all framed and they are still hanging in my office. We had the best boxing posters in the nation at the time. Each poster is literally a work of art! After graduating RPI and working as an architect, Jeff opened his own studio, Animated Arts, as a freelance animator. He worked on several children's shows for ABC network - providing animation for segments of the shows. He also- produced commercials for almost every state agency and advertising agency in the region. Some of his notable work involved introducing the brand Price Chopper to the marketplace, along with numerous other new businesses - including the Great Escape, the Times Union, Colonie Center, Whiteface and Gore Mountain, Curtis Lumber, WRBG & WNYT, as well as statewide campaigns for I Love NY and the NYS Health Department. So, turning to Jeff to have him create the label for my bottle was a no brainer! I told him the type of logo I had in mind for the label, an Owl in the tree of life. Within an hour, he sent me hundreds of images of owls and trees! He worked throughout the night trying to create a peaceful yet intense looking owl. There were so many owl images that looked angry or cartoonish. It actually took us a long time before we found our One With Life owl! Jeff came up with the idea of blending the owl into the tree of life and making a heart on the outside of the owl’s chest. It is all very subtle yet sends a strong message. On a personal note, Jeff is a humble, intelligent and humorous guy. He shares my eastern philosophy and we spent a lot of time waxing poetic about what it means to be one with life! He is also a very talented musician who plays the guitar and writes songs - a man of many talents. Jeff was the second member of Team OWL and I am so grateful to have him in my corner! I met Gonzalo Spindola-Garcia about two years ago when I was researching the tequila business. Gonzalo and his family own a very successful tequila bottle design and marketing company and he has written quite a bit about how to build a successful tequila brand. When I contacted him via skype, it was quite easy for him to figure out that I was a total novice, not to mention working with a shoestring budget. Basically, where I was at, he was pretty much out of my league. Despite that, Gonzalo made me feel like I could make a go of it. He has the kind of energy that makes the impossible seem possible, which is so motivating for me. I had the chance to see some of Gonzalo’s work in Mexico. He decorates bottles for more than 50 Tequila and Mezcal brands. Some of his work includes fire decals, silk screen, spray color coding and sandblast on bottes. We connected through his blog, 10 Essential Steps to Start a Tequila Business, which he has been writing since 2010. He gets emails and calls from people around the world. If you understand the spirits industry, the bottle is so important for moving the product off the shelf. As I mentioned, Gonzalo was a bit out of my league when it came to producing my bottle, but he, nonetheless, helped me make important strategic decisions to get my brand off the ground. He became an instant friend and the first member of Team OWL. I now rely on Gonzalo for coordinating all of the Mexican operations for One With Life Tequila. Although I speak some conversational Spanish, conducting business in Spanish is a whole different story. Gonzalo helps me to navigate the language barrier as well as all of the complex parts of the tequila company that lead up to the actual import. Most importantly, Gonzalo helps me taste each batch before it gets bottled to ensure consistency and quality control. Tough job, but somebody’s got to do it! The tasting of each batch has become a ritual for Gonzalo and me and is my favorite part of the process although Gonzalo may have a different view. He had to put up with my hours and hours of tasting different versions of the tequila when we first started until we got it right. It was a long and crazy process that included laughter and tears, but well worth it. The taste is definitely unique and is the most important aspect of One With Life Tequila. Tasting, however, is not the last step in the process. He lives and works in a town called Tanala with his wife and son. He is a great family man and one of the hardest working people I know. He is a man of humility and true integrity. He also has a good sense of humor. Gonzalo has been a God send for One With Life Tequila and there is no way I could have done this without him. He continues to be an integral member of Team Mexico operations. To me, business is definitely personal. I put so much of myself into the work I do and I am grateful to be able to work with Gonzalo. He has passion for his work as well and it shows. He is a smart business man and a trusted partner as well who shares my vision of being One With Life. For most of my life, I have always been attracted to inspirational stories. The common thread in every one of these stories is staying positive, focused and overcoming all obstacles to achieve a goal, always putting faith in front of fear. I have also found that such people are very often the most giving and willing to help others to achieve their goals as well. Inspiration is what has driven me to brand my own tequila, a spirit I have grown to love, as a vehicle to inspire others to get the most out of life and to live their passion. So how, you ask, is bottling tequila a vehicle for inspiration? I have always associated tequila with celebration, most often with friends and colleagues after a job well done or just for relaxation. That shot of tequila was an opportunity to play and to keep life lighthearted. It is also a tough industry so it presents a challenge for someone like me to break in. My goal is to never give up, work hard and enjoy the ride, hopefully inspiring my new tequila friends along the way. That is why I ruminated on every detail of One With Life Tequila starting with the brand name. One With Life represents being at peace with the present moment. It means going with the flow of life without resisting. It is having the ability to change the things that can be changed and to accept the things that can’t. That means not spending time worrying, stressing or being consumed with the past or future. Instead, embracing the uncertainty of life. Within every bottle is an inspirational message that coincides with the One With Life philosophy. Many of these messages were shared by the many friends, family members and members of the community that are all a part of my tequila group and who have all contributed to the start up. There is also a life-affirming toast on the back of every label that says: Here’s to being fully present, listening deeply, speaking with love and being One With Life. The logo represents the philosophy with the tree of life symbolizing the connectivity of the universe. The Owl represents awareness, courage and relaxed focus. The bottle fully embodies the philosophy of what it means to be One With Life. I want to use this opportunity to express deep gratitude for all the people who have supported me and had faith in the project from the beginning. I will continue to use this blog as a forum to recognize those people who have and continue to inspire me to move forward.